What is it like to stand stock-still for hours on end by the walls of the Kremlin come rain or shine, guarding the Tomb of the Unknown Soldier? RBTH found out about life as a guard in the Presidential Regiment. In fact, these are young men from all corners of the country who have been assigned to serve in the Presidential Regiment. The requirements for selection for the regiment are motivation, a minimum of a high school education, no criminal record or police arrest, a sound ethical and psychological condition. However, those wishing to join the regiment must also pass strict criteria for external appearance: They must have the ‘correct’ facial characteristics, be between 5.7 and 6.2 feet tall and have no tattoos or scars. Of these men, several are selected for the special guard company — and these are the men who onlookers see standing motionless for hours beside the Kremlin walls. 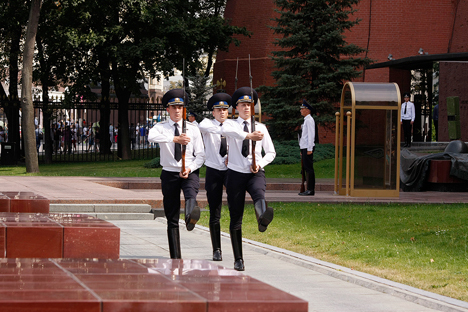 The Tomb of the Unknown Soldier was installed in the Alexandrovsky Garden next to the Kremlin’s walls in 1966, in honor of the 25th anniversary of the defeat of the German army near Moscow. It is a monument honoring all the Russian soldiers who perished in World War II. Its other name is Post. No. 1, or the “country’s main post. In nine months of service, Alexander Makartsev, a private in the 1st Company of the honor guard, has quick-stepped to his post on 150 occasions, raising his legs to an angle around 90 degrees. This means that he has spent an entire week of his life standing at attention. According to Makartsev, the main offenses among the soldiers are staring at young women and at “their own”: When people in the same uniform show up, it is striking. What does a guard think about when he is on duty? Yevgeny Ryndin, a comrade-in-arms of Makartsev’s in the 1st company of the honor guard, says that for him it is the social and moral significance of the monument and all that it represents that occupies his thoughts. “When things like that happen, I try to look up and disengage myself from the crowd. I notice what’s happening and hear what people are saying, but I don’t succumb,” he says. The guard shares some of the secrets: If a wasp lands on you, do not panic — it will fly away on its own. If you need to cough, touch your tongue to the roof of your mouth and the urge will pass. Sneeze inside yourself. Yawning and scratching are categorically forbidden. In case of emergency, a guard can count on a partner to help him out: Another watchman stands a little way from the Tomb of the Unknown Soldier. He whistles a prearranged signal if someone suddenly decides to encroach on the monument. If the guards need assistance, they have secret signs — they do not shout “Come over here.” Instead, the thumb and index finger on the ramrod of the rifle clang on the shaft and the watchman approaches the guard to, for example, fix his uniform or wipe off his face. The guards each hold a Simonov semiautomatic carbine. The bullet in such a carbine is lethal at a distance of up to a mile. However, Makartsev said that even if the guards were to deploy their weapons, the safety of the people around them would be paramount. There is a perception that it is easier to serve in the Kremlin regiment than in other divisions. The barracks of the special guard company even have their own movie theater in which soldiers can watch contemporary patriotic films. The young men also take part in amateur performances: The regiment has a full orchestra called the Optimists, and there are organized outings to the theater. However, Makartsev said that in many ways there is little difference between joining the presidential regiment and being conscripted into an ordinary army unit. Makartsev said that at first everybody tries to hide their negative sides, but soon the essence of the person appears. Everyone is different. Someone might, for example, do an unusual martial art like wushu. Makartsev enjoys art, and has decided to make the subject of his next painting the changing of the honor guard. He plans to give the painting to his mother or a comrade-in-arms. The young guard is also a barber: It is his haircuts that are concealed under his peers’ caps. Here, in the barracks, he seats his ‘customers’ in a huge leather armchair in which former Russian president Boris Yeltsin used to get his hair cut — the chair was later scrapped and given as a gift to the regiment. Serving in the Presidential Regiment provides some privileges to soldiers. After serving, each soldier receives a rating that helps him with job placement. Serving in such a regiment also gives soldiers privileges when it comes to pursuing higher education: Former soldiers can enter Moscow State University (MGU, Russia’s oldest and largest university) without taking entrance examinations if they receive a recommendation from their commanding officer. Makartsev is taking advantage of this option, and plans to submit his documents to MGU during the next school year. For the young soldier, who now has three months in the special guard company remaining, the lessons he can take from his service are clear. “It was precisely in this place that I understood that a person has no idea what he is capable of,” he says.